The final four paintings are the conclusion of the project. All extraneous objects (such as shadows) have been removed from the image. The colours are clearly defined and tonally honest but still reflective and symbolic. 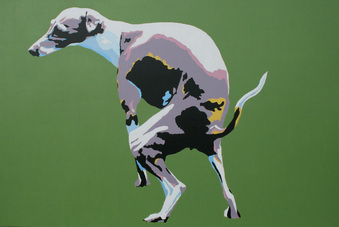 'Artmeis Mr Zoom (Zoomie) with his ear on 'alert' - the elegance of the Italian Greyhound is still evident. The dog performing it's ultimate Guerilla behaviour. Lottie with her favourite toy. The image is reduced to its elements: colours interact and define form while reflecting local colours and surfaces. This painting plays with abstraction but retains allegiance to the dog/object. This painting shows how much my life is analogous with the lives of my dogs - Lottie and I are almost indistinguishable.